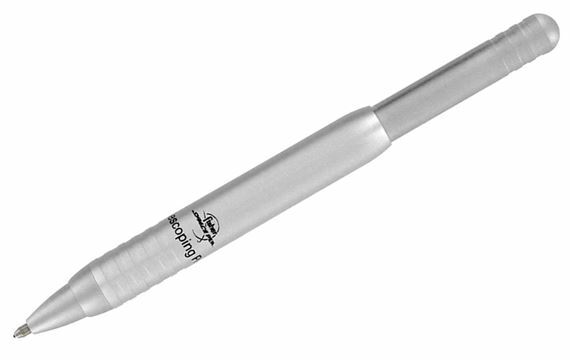 Order your Fisher Telescoping Metallic Aluminum Ballpoint Pen today from FahrneysPens.com. Fine Pens, Refills & Luxurious Gifts – great prices & fast shipping. Get a famous Fisher Spacepen in a compact model. Unlike other pens that rely on gravity to write, the pressurized Spacepen writes at any angle, over almost any surface, and at extreme temperatures giving you a reliable writing instrument wherever you go.The Fisher Telescoping Pen has a compact, sleek shape that slips into pockets or purses for convenience. When you're ready to write, pull the pen extender and out pops the smooth-writing ball point. The Telescoping Pen goes from 41/4 closed to 51/8 when activated. All-metal barrel is sturdy and handsome.